We knew it was coming and now it is official. Sprint has announced the HTC Arrive, the carriers first Windows Phone 7 device, will be available on March 20th and it’s available for pre-order today. The HTC Arrive will be priced at $199.99, after a new 2-year contract or eligible upgrade. Full specifications available after the break. Have questions? Plan on making the jump to Windows Phone 7? Join us in the HTC Arrive forums! 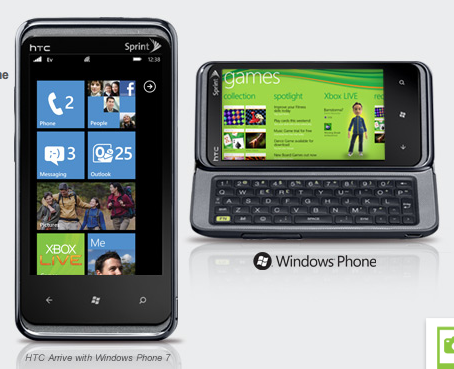 The HTC Arrive™ smartphone is the first device from Sprint based on Windows Phone 7. It offers an innovative design with a sliding full QWERTY keyboard and tilt-up display and provides an incredible experience leveraging well-known Microsoft services, like Microsoft Mobile Office, Zune and Xbox LIVE. Windows Phone 7 features Hubs for quick and easy access to the user’s most valuable content, including People, Pictures, Games, Music & Video, Office and Marketplace. Additionally, the Start screen is customizable with Live Tiles that come to life with real-time updates. Depending on the app, the Live Tiles might show pending messages and appointments, news and weather, or game and friend status – all continuously refreshed by the Web. Uh.. Why is Verizon so slow to announce! Sprint before Verizon! I am bummed.. I tried Tmobile, and the service was HORRIBLE in my area.. No service at all.. Went back to verizon the same week, and now my account has me stuck for a year unless i want to pay the early term fee.. I didn’t think they would be able to do that without me signing/buying into a new contract?? I might fight it if Verizon continues to not support the Win7 phones.. Any news is good news.. A date.. something! Theres gotta be more phones for sprint! Dude… where are the other phones, Sprint? I just want on that is like the HTC incredible.. is that too much to ask for? Why are all their phones so ugly or big! The 16gigs of internal storage is nice but why create this devie without a 4G radio? There are still plenty of areas without 4G. I live on Long Island and Sprint has yet to turn on 4G here.